In honor of the Fourth of July, we are putting all of the books in our series on sale for $0.99 starting July 3rd! And keep in mind that the fifth and sixth books in our series can be downloaded for free through this blog! Go here to get them! Use 21Oct1805 to get in. As always, thank you for your interest and support! It is with regret that we announce we will be postponing work on the series indefinitely. With numerous life-changing events happening this year, we unfortunately don’t have the time to commit to writing the book worthy of you. We very much appreciate all the support you have given us, and thank you in advance for your understanding. It was five years ago today that we hit the publish button for The Alecto Initiative. We had no idea what that would mean and close to zero expectations anyone would actually read it. That you did read it, and the books that followed after it, continues to fill us with joy and wonder. After all, you spent time reading our work that you could have spent doing many other things, but you chose to spend it on us and that is an extraordinary gift. A deep and heartfelt “Thank you” to each and every one of you for that. You mean the world to us. Keepers of the Wellsprings, New Release! 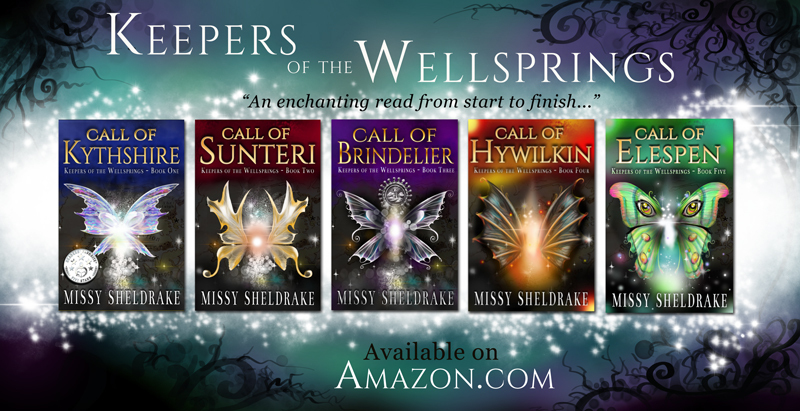 For those of you who enjoy fantasy as well as sci-fi, we’re happy to announce that Missy Sheldrake will be releasing the fifth and final book in her Keepers of the Wellsprings series, Call of Elespen, on November 29! It is now available for pre-order here: https://www.amazon.com/dp/B077MTB5KH/. Galleries of illustrations and excerpts from the Keepers of the Wellsprings series can be viewed on her website and blog. We urge you to check it out! Get the first 3 books of of the Loralynn Kennakris Series for 99 cents! The Alecto Initiative (Book 1): A freedom to die for? Eight years growing up in hell prepared Kris for everything but freedom, and her new life is not what she imagined. Not only must she find her way in a bewildering society full of bizarre rules, but the very people who rescued her think she’s a terrorist plant, a beautiful interstellar celebrity is complicating matters in more ways than one . . . and now someone is trying to kill her. The Morning Which Breaks (Book 2): It was supposed to be the beginning of a new life . . . not a replay of her old one. Enrolled as a cadet at the Nereidian League’s military academy, all Kris brings with her is a unique set of skills, a profound ignorance of ‘civilized’ society, and a large chip on her shoulder. But if she isn’t quite sure what to make of the Academy, the Academy has no idea what to make of her. So when she’s approached to help capture a terrorist warlord, Kris is more than happy to leave the halls of academia behind for awhile. Kris knows she’s not signing up for any pleasure cruise. What she doesn’t know is that the key to the mission’s success is reliving her very worst nightmare. Wogan’s Reef (Book 3, Pt.1): War is all hell . . . and there’s no place like home. War has erupted between the Nereidian League and the Dominion of Halith, and it’s not going well. The League’s Colonial Expeditionary Forces have been forced to bend repeatedly but they have yet to break. For Ensign Loralynn Kennakris, Lieutenant Commander Rafael Huron, and a Marine captain named Minerva Lewis, the time for bending is over. They’re on a mission to start breaking things, and they don’t much care if they have to go through hell to do it. Asylum (Book 3, Pt.2): Armed. Dangerous. And nothing left to lose . . .
First they called her a hero. Then they called her a medical problem. Now they’re calling her a criminal. It’s been an exciting first year of active duty for Lieutenant Loralynn Kennakris. Pushed too far, Kris did the unforgivable and her enemies finally have the excuse they’ve been looking for. But they are right about one thing: Kris is dangerous, and now she has nothing left to lose. Get the Loralynn Kennakris Series Boxed Set: Books 1-3 (Kindle Edition only) here: https://www.amazon.com/dp/B01CPLN5MG! And as always, Thanks You for your support! 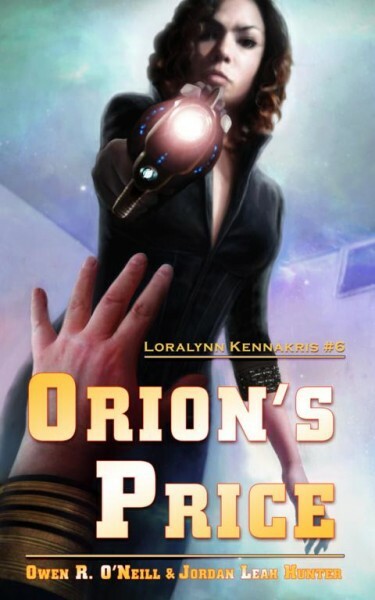 The Bonds of Orion is live! We are so happy to announce that The Bonds of Orion went live on Amazon last night! Thank you all for sticking with us during the long bumpy road to getting this book published! Your support is appreciated more than we can say! We have an update on The Bonds of Orion. The final draft is ready for proofing! We are waiting to hear from our editor regarding her schedule for getting that done. Once she lets us know, we can announce a firm release date. We are very much hoping that it will be sooner, as in a couple of weeks, rather than later (as in a month). Thank you all for your patience while we got this book finished. Your continued support is very much appreciated! In honor of Memorial Day, we are holding a special sale! Today and tomorrow, pick our whole series for less than three bucks! That’s right! Alecto is free and the other books are 99¢ each! Here are handy links for each book! Get them all or buy a copy for a friend! This sale ends Memorial Day (Monday, May 29th) at 11 PM PDT. For those of you on our mailing list, Chapter 13 of Bonds of Orion will be released tomorrow, by 2 AM, PDT. Look for it then! … In your regularly scheduled programming. Due to the intercession of life this week and a trip this weekend, we will not be releasing a new chapter of The Bonds of Orion this weekend. Rest assured that we will be back on track next week. Our apologies for the delay. Wishing each and every one of you a Happy Mother’s Day!